This is a very important portion. It speaks of so many things that are historical patterns that have echoed throughout the ages since, the battle between Yitzchak and Ishmael, the choices made in the fleshly, carnal, physical realm rather than in the spiritual, and the lives and legacies of Sarah and Rivkah. Yet it’s named after the life of Sarah, the only Matriarch after whom a portion is named. It shows us so much of how the Lord G-d understands women’s standing and roles; so how sad it is when we see now how history has turned out negatively towards women and how so much of the Scriptures have been abused to subjugate and make women subservient to men. In the Torah Sarah is clearly an important person in herself to the Lord, not just as Avraham’s wife. This passage begins with her death because in Judaism the value of someone’s life is measured then, not at birth. The value of a human life is not measured by whether you were born with a silver spoon in the mouth, nor even on what you inherited or managed to accumulate during your brief span on this earth, but the real value rests on what you bequeath to the next generation and beyond. What hallmarks of your life do people follow, copy and talk about? Sarah gave us so much. 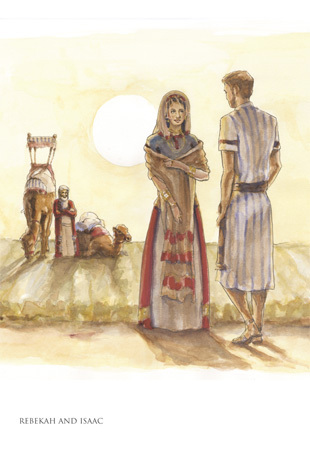 Not for nothing do we read that Yitzchak took Rivkah to his mother’s tent and was comforted, a woman who would continue to stand for what his mother had stood for. That’s a great legacy. Rivkah was clearly a special woman. The servant goes off to find the wife, he knows that G-d will guide him, prayer had already laid the foundation of this event in history: the meeting of 2 people whose lives were to be intertwined. Such a crucial day in the lives of any two people at any time, the recognition that your beshert(ah) is standing before you. Yet the one person who we think should be involved in this choice isn’t even there: Yitzchak! Doesn’t he get to have any say in the matter? In fact according to Bereshit 24:67 he seems to fall in love after the event! Surely he should have a say in this, start to date her before committing himself, maybe in more modern terms cohabit and do a trial run. But no, a servant is sent to find a wife for him on command of his father. Who would trust to such a method today? And why should Avraham seek a woman from amongst his own brethren? Wasn’t his own family a family of idolaters? Maybe so, but we read in Bereshit 24:50-51 that both Lavan and Bethuel see the Lord’s hand in this meeting; somehow the meeting that Avraham had with the one true G-d had impacted wider into the family than we may think. There is no indication here that this was tongue in cheek or merely jargon. They were after all risking a daughter being sent away to a foreign land, given to an unknown husband. They trusted that in all this the Lord had His hand and it was in His sovereign control. What is it that the servant is looking for? He waits for the woman who will do certain things, show qualities that he knows are the hallmark of a dedicated and genuine woman of G-d, a woman well taught in and of the Lord. Are the hallmarks of a deep spiritual conviction present, the ability to operate in a compassionate and submitted way? The answer as it comes to the servant is yes. Rivkah has learnt well and is now the key to the next step in the unfolding promises of G-d. G-d’s choices are made on the basis of the qualities we develop and nurture, what He plants in us that we allow to grow in the Spiritual realm. That is why so much space is given to this encounter in the Torah. It is no co-incidence that Rivkah has to make the same faith journey that Avraham made, leaving family and country for what she didn’t know. If there is a major theme that develops in all these events here surrounding the meeting and growing together of Yitzchak and Rivkah, ultimately their marriage, it is this: faith and trust in the absolute sovereignty of G-d in the affairs of our lives. We see it with Lavan’s response and Rivkah’s too. If our lives are fully yielded to G-d, then we have nothing to fear. We so often worry about getting married and to whom and try to find our mate, desperate in case we miss the one. But G-d is well able to bring about godly marriages truly made in heaven. He knows us better than we do, and in due season, at the right time, He will bring it about. Rivkah’s faith in the sovereign actions of her G-d, a G-d she knows and trusts, leads her to accept His will, even at the expense of leaving everything she has known up to that point in time. Her faith is revealed in her responses too. Whereas her mother and brother request a 10 day farewell party for her, reluctant to let go, Rivkah simply says, I’ll go. No questions, regrets or excuses, no soul searching or apparent struggle, she is ready to believe, trust and have faith that G-d was about to reveal to her her own intended and mate, the one who would complete her own life and she his. We see it again with both Rivkah’s and Yitzchak’s response to those around them. In both cases the parents have a full part to play in this arrangement. All parties operate in faith, and believe that G-d is the one who is able to steer the destiny of human beings. They submit to their parents in this. Nowadays this might seem strange, but we mustn’t forget that clan, tribal and heads of house operated in a quasi-priestly way at that time. What this demonstrates is that both were willing to submit to godly authority in this vital and crucial decision of a running mate in life. In Judaism the idea of arranged marriages is not a forced one but one where all parties play a role. All should have faith in the G-d in whom all our lives have meaning and value. Qualities, godly qualities lie at the heart of these events. This passage teaches us so much about the men and women who G-d used in the past, the very hinges of generations and the unfolding will of G-d. Whether we become a part of that unfolding will hinges on how we live, the choices we make and above all the qualities we have that make us usable, whether male or female! Will we be godly people who trust in Him totally? Can we for one moment step back and ask ourselves the deep question, is this us? Do you rest and relax in the Lord’s will, letting things run their course knowing that He is in control? Knowing when to intervene and when to let alone? Do you fundamentally see G-d’s hand in your life, or just your own? Do you worry about things that seem beyond your influence or control? Does that make you feel afraid? This isn’t about fate here, that is lifeless and random, this is about trusting in a living G-d who absolutely determines your course and way through life in such a way that you can relax and let go and not fear. We ruin our lives so often with stress, anxiety, fretting over things, thinking if we truly trust G-d we’ll lose everything. Do you, can you accept G-d’s purpose for YOU, and not what He has for others? I’m sure by now you’re beginning to realise actually how hard all this is. If you’ve been there you’ll know what I’m talking about. I’m talking about going beyond the mere words we say, how much we trust and believe, and DO IT. If G-d isn’t able to come through at the moments when it truly counts, when you’re hanging in with your fingernails in faith, then He isn’t G-d. He is and He will. We need to have an utter confidence in the fact and reality of G-d’s ability to steer your life, and His plan for our lives, and to mean it not just say it. Rivkah and Yitzchak had it. In the big decisions of life, and they don’t come much bigger than marriage, they trusted absolutely in the G-d who was and is able. For them G-d’s sovereignty meant just that, He was G-d and King. Let us have the same faith they had; after all, it is the same G-d we worship.